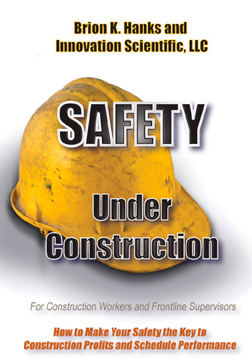 In our book, Safety Under Construction, we address the safety versus productivity contradiction because safety isn’t sustainable unless it is also practical and pervasive. We will help you achieve a 100% accident free environment and show you how to increase productivity at the same time. Although, plenty has been written on the subject of safety, construction industry best practices have failed to deliver on 100% zero-harm. Therefore, we need a new way to look at the issues. This safety book is different than any other book on safety you have ever read. You’ll step through an innovation process and ‘charge up’ your brain so that when you are finished with it, you will think about safety differently and you will imagine whole vistas of new opportunities. Educate yourself. Get the book. Join the community. Help us make safety more pervasive and profitable. SAFETY UNDER CONSTRUCTION (For Construction Workers and Frontline Supervisors) IS NOW AVAILABLE IN 57 COUNTRIES AROUND THE WORLD. You can order your book in most bookstores or buy it here. BUY YOUR COPY NOW. Are you “anti zero harm” language? dayna hubenthal on Are you “anti zero harm” language?